We have been making an effort to add more meatless dishes to our menus on Meatless Monday and on other days of the week. 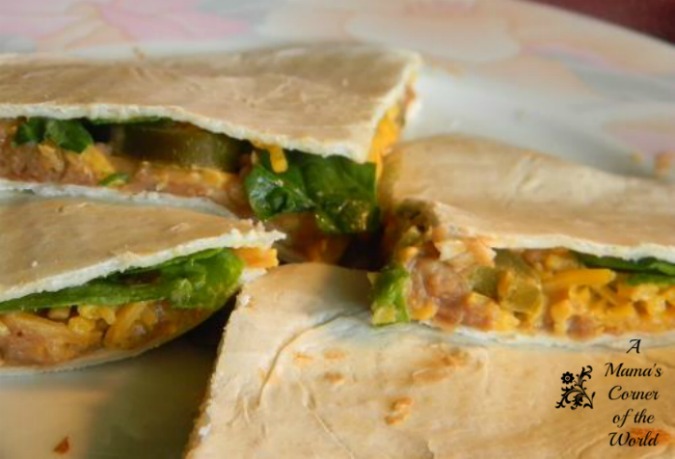 This weekend, the girls made these quick and easy, spicy jalapeno, bean and cheese quesadillas for lunch. They substituted black olives for the jalapeno peppers on their quesadillas, but they loved them--and I loved that they were quick and easy and made very little mess! These also pack well for lunches and add a little something different to those lovely meals on the go between extracurricular activities! Heat the refried beans. In a small, nonstick sauce pan, heat the refried beans over low heat until heated through. Build the Quesadilla. Begin with a sprinkle of shredded cheese on one tortilla. Spread the ¼ of the beans onto the quesadilla, followed by ¼ of the jalapenos, ¼ of the spinach or lettuce and ¼ of the shredded cheese. Top with another tortilla wrap. Grill or press the quesadilla and serve. I generally use a 10-inch skillet or a table top sandwich press to heat the quesadilla and melt the cheese. Preheat the sandwich press according to manufacturer's instructions and press the quesadilla as directed. If using a skillet, preheat the skillet and heat the quesadilla on one side for 1-2 minutes--then flip and heat for 1-2 minutes on the second side, or until the cheese melts. We cut each quesadilla into two servings and serve with sour cream.